BELLVILLE – Though the end of the year is still one month away, council members are getting ready to tap into 2019 business. Committees on village council are planning agendas for the new year. The finance committee, chaired by member Jason Guilliams, has to set its next meeting. This is the committee that oversees village financial matters. Several committee chairmen said their groups are ready to provide figures to the finance committee so work can proceed. Council member Jason Potes said the community development, shade tree and safety committees are ready to provide information to Guilliams’ committee. Village administrator Larry Weirich said salaries have been discussed. For the safety committee, Potes said, the matter of a new police cruiser will have to be considered. Several committees have to complete their work. A streets committee meeting will be held Nov. 28 at 5 p.m. at the Bellville Police Department. Mayor Teri Brenkus commended police officer Thomas Queen, who recently testified at a trial where residents of Mount Vernon had been charged with drug offenses. Queen told council he had spent 8½ hours testifying at that trial. Brenkus said one defendant was sentenced to 22½ years for the offense. The two defendants are Robert Wheeler, 47, and Amanda Higgs, 24. When the two were arrested, 10 ounces of drugs were confiscated in addition to $10,000 in cash. Brenkus told council about a number of holiday events which have been scheduled for the village. Richland Gives is scheduled for Nov. 27. The Yule lighting, coupled with an appearance by reindeer, will be Dec. 6. The reindeer, from a local tree farm, come first at 6:30 p.m. The yule lighting follows. There will be a Christmas parade Dec. 8 at 11 a.m. Free carriage rides will be offered, and hot dogs and cocoa will be provided. The village Christmas home tour is Dec. 15. Tickets may be obtained at the Wishmaker House. The tour is from 4 to 7 p.m. Tickets are $10. There will be a performance by the Domka string quintet Dec. 16 at the opera house. This will be at 2 p.m. Tickets are $5 for adults and $3 for children 10 and under. Several groups have agreed to sponsor the event, which is helpingn to keep ticket prices lower, said Brenkus. The sponsors are Fast Eddie’s Pizza, Beachy Chiropractic, Elzy Milling and Trade, Country Meadow Care Center, Golden Family and Merchants Bank. Tickets can be purchased at the door or at Stoodt’s Market or Mechanics Bank. Weirick told council a replacement Jet-Vac truck is now in the village. This was obtained in Alabama, and Weirich and a village employee went to that state to pick it up and drive it back to Bellville. Brenkus congratulated the Clear Fork Valley School football team for its successful season. She said a proclamation is being prepared in conjunction with Butler Mayor Joe Stallard and Richland County Commissioner Darrell Banks, congratulating the team. Photo by Jeff Hoffer This year’s Christmas parade starts at 11 a.m. on Dec. 8. This photo is from last year’s parade. 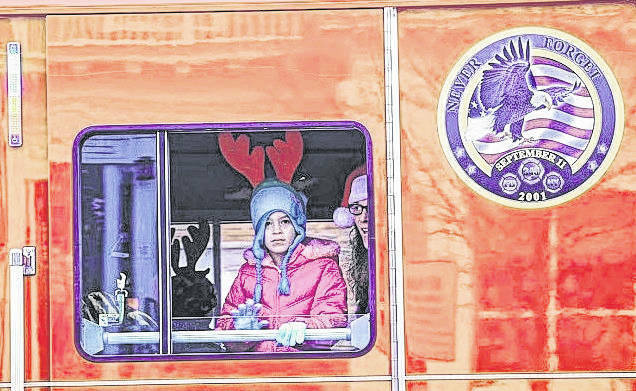 https://www.thebellvillestar.com/wp-content/uploads/sites/39/2018/11/web1_2017-Christmas-parade.jpgPhoto by Jeff Hoffer This year’s Christmas parade starts at 11 a.m. on Dec. 8. This photo is from last year’s parade. Nov. 27 — Richland Gives. Dec. 6 — The Yule lighting, coupled with an appearance by reindeer. The reindeer, from a local tree farm, arrive at 6:30 p.m. The yule lighting follows. Dec. 8 — The Christmas parade starts a 11 a.m. Free carriage rides. Hot dogs and cocoa will be provided. Dec. 15 — Christmas home tour from 4-7 p.m. Tickets cost $10 and may be obtained at the Wishmaker House. Dec. 16 —Domka string quintet performance at the opera house. Starts at 2 p.m. Tickets are $5 for adults and $3 for children 10 and under.